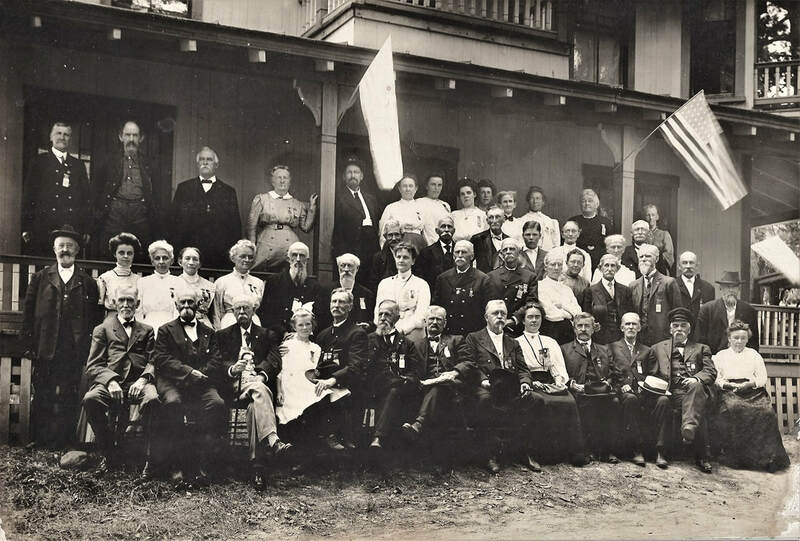 In this undated photograph, Civil War veterans (their spouses, widows and/or family members) of the 16th New Hampshire Infantry gather at their ​​regimental building located in the N.H. Veteran's Association complex at The Weirs in Laconia. Many of the men can be seen wearing GAR medals, as well as the NHVA Reunion (rectangle shaped) badges. Some of the women had Woman's Relief Corps (the auxiliary to the GAR) medals as well. On the back was written: "Mother Webber, Bernard, Andy Holt + wife, John Carkin", though there was no indication of where these people were standing in the above photo. Mother Webber was probably Maria L. (Taggart), widow of Brooks K. Webber of Company I (16th NH). They had a son named Bernard born 1895, who may be the young man in the third row centered between flags. Brooks died in 1903, so this photo may in 1910's, based on Bernard's age in picture. Andrew "Andy" Holt, a sergeant in Company G, was a Lyndeborough resident. His wife was Abby J, whose obituary mentioned she was a member of the Woman's Relief Corps, and she died in 1916. Andy passed away in 1924. John C. Carkin was also a Lyndeborough native, and he had served in Company H. He died in 1923. 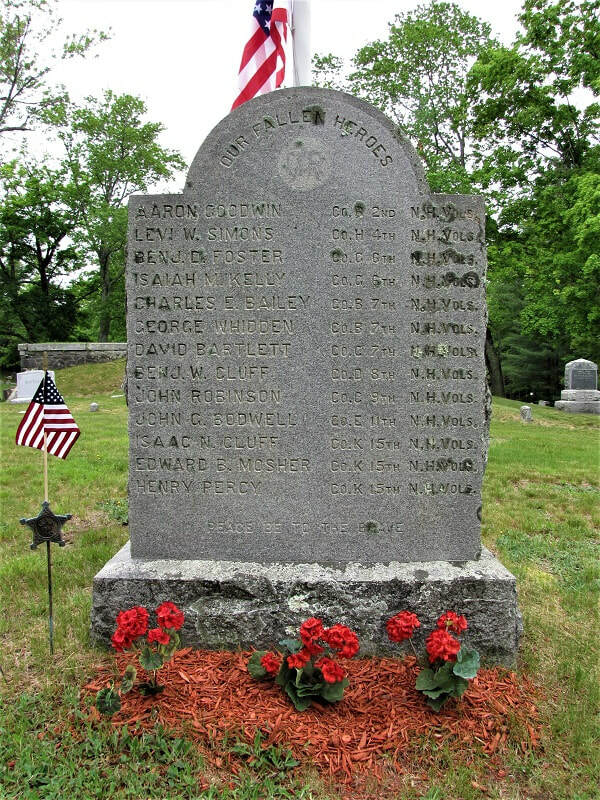 The New Hampshire Veteran's Association was originally made up of Civil War veterans, and was formed in 1875 (in Manchester, NH). Their second reunion was held at Weirs Beach (or The Weirs) in 1878, where they continued to hold their encampments in the decades to come. Land was donated the following year, and buildings were constructed to house the veterans of the individual NH regiments. The JOHN J. HANSON Camp, No. 30, Sons of Veterans, was formed in Newmarket, NH in the summer of 1907. 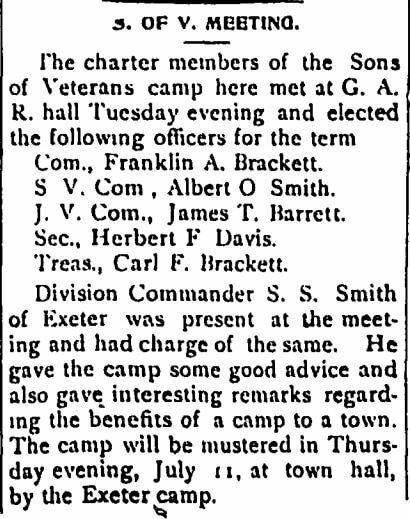 25 charter members gathered at the GAR Hall in June, where they planned instituting a camp in town. On Tuesday, the 2nd of July, they met under the guidance of the NH Division Commander, Samuel S. Smith of Exeter, to elect officers. They named their camp after Sgt John J Hanson, who had served during the Civil War in Co. D, 15th New Hampshire Infantry. He was later captain of the "Newmarket Guards", a company of State Militia. He was a GAR member, being the first commander of the George A Gay Post #18, in Newmarket. He died in Manchester, NH in 1899. The LOUIS BELL Camp, No. 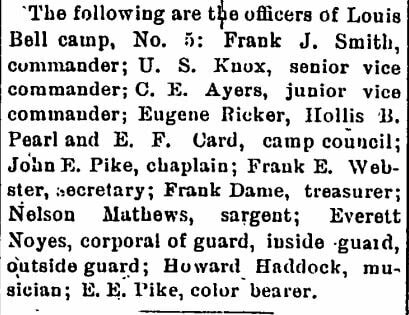 5, Sons of Veterans, of Farmington, New Hampshire, was mustered in with 33 members. Officers from Dover, NH had driven up in autos, but had arrived later than expected, preventing many more potential members from being mustered in until a later date. This town had previously been home to a Camp of this same name in the 1880-90's, then No. 15, but had disbanded. ​The camp was named for Louis Bell, who was a lawyer living in Farmington at the time the war began, and had served first as Captain of Co A, 1st NH Infantry, then later became colonel of the 4th New Hampshire Infantry. He died, on 16 Jan 1865, of wounds received at Fort Fisher, North Carolina, and is buried in Chester, NH. There was also a GAR Post (Louis Bell Post, No. 3) in Manchester, NH named in honor of him. 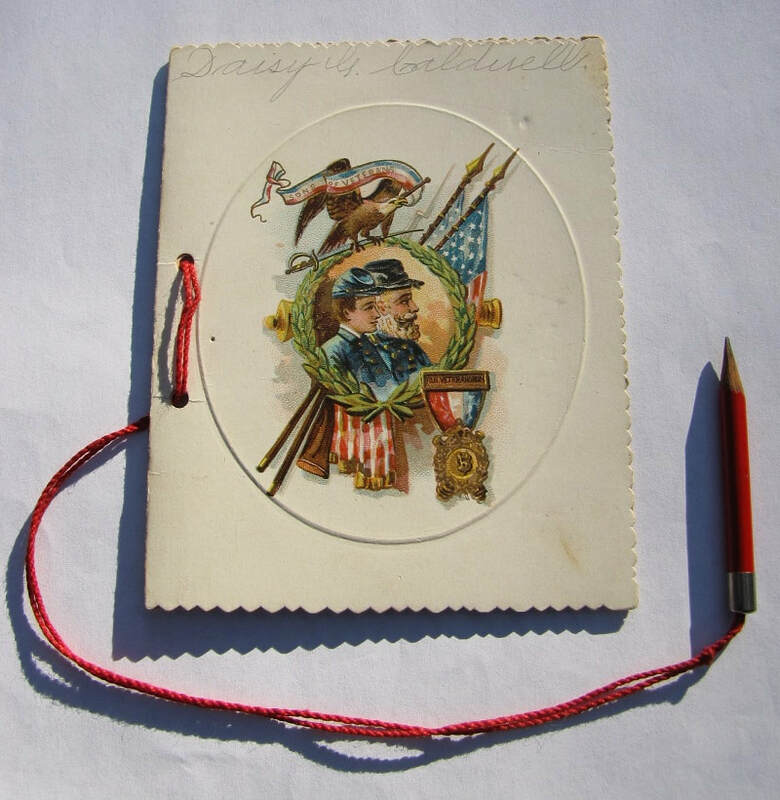 Born in Haverhill, MA, a res of Salem when he enlisted for 3 months on 23 Apr 1861, age 20. Not mustered in, he reenlisted for 3 years on 15 May, and must in as private on 1 June '61. Wounded at Gettysburg on 2 July 1863, he died on 17 Aug at McDougall Gen. Hosp at Fort Schuyler, New York. He is buried in Cypress Hills National Cem. Born in Alexandria, NH, a res of Salem when he enlisted on 2 Sept 1861, aged 35, and mustered in on the 18th as a corporal. He died on 2 Oct 1863, and is buried [as Simonds] in the National Cemetery in Beaufort, SC [grave #1516] note: Aylings shows he rec a disability disch on 24 Oct 1863 at Morris Island, SC, as does must-out papers. A Salem, NH native, he enlisted, at age 18, on 17 Oct 1861, and mustered in as a private on the 28th. He was killed in action on 29 Aug 1862. ​At age 37, the Salem native enlisted on 6 Nov 1861, and was mustered in as a private on 28 Nov. He was killed in action at Bull Run on 29 Aug 1862. Born in Salem, and a resident there when he enlisted on 14 Aug 1862, aged 23. Mustered in as a private on the 28th of Nov '61. Captured 18 Jul 1863 at Fort Wagner, he died of disease on 3 Jan 1864 in Richmond, VA (Confed Gen. Hosp). He is buried in Richmond National Cem. Records show him in Co. D, and was born in Londonderry, NH. Credited to Salem when he enlisted on 14 Aug 1862, aged 29, and mustered in on the 21st as private. Wounded 14 May '64 at Drewry's Bluff, VA, he died as a result of his injuries on 25 June at DeCamp Gen Hosp on Davids Island, New York. His body was returned home, and buried in Sunnyside Cem, Londonderry. 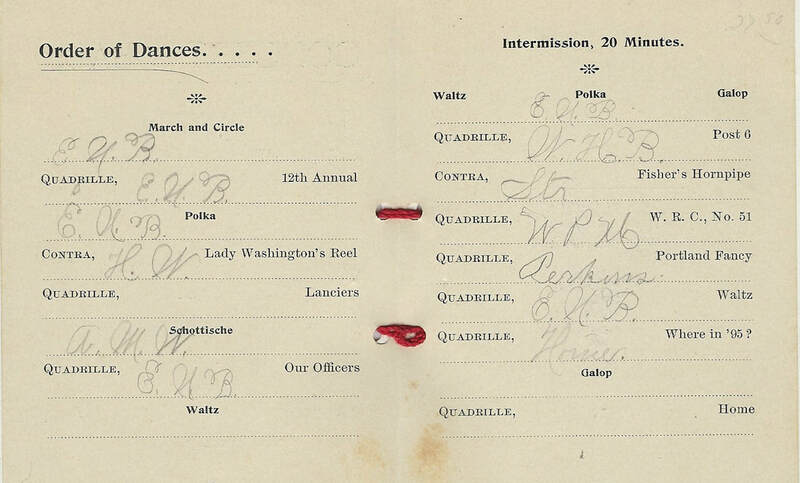 Company shown as B in records, he was born in West Newbury, MA and a res of Salem when enl on 23 Sept 1861. Must in as pvt on 1 Nov '61, he re-upped on 27 Feb '64. He died from disease in Wilmington, NC on 3 June 1865. A Salem native, and brother of Isaac below, he enlisted at age 25 on 30 Dec 1861, and must in the following day as a private. He died from typhoid at the St James General Hospital in New Orleans on 29 Dec 1862. Born in Londonderry, he was in Salem when enlisted on 4 June 1862, aged 25, and must in on 22 July as pvt (later appointed corporal). Wounded at Fredericksburg on 13 Dec 1862, he died on 2 Jan '63 at Washington, DC. born/res: Salem; enlisted, age 20, on 15 Aug 1862. Must in 29 Aug as pvt. Died of typhoid on 28 Dec 1862, at the regimental hospital in Falmouth, VA. Brother to Benj'm (in the 8th NH), and Salem native, enlisted 11 Sept 1862 and must in as pvt on 16 Oct. He died of disease on 2 Aug 1863 in Memphis, TN. Born in Temple, Maine, he was a res of Salem, aged 44, when enlisting on 8 Sept 1862. He was mustered in 16 Oct, a private, and served until being killed in action at Port Hudson, LA. This name not found in the rolls of the 15th NH, or in pension index. Born in Lynn, MA, and res of Salem when enlisted on 15 Sept 1862, aged 18. Must in as pvt on 16 Oct '62, he died from disease on 27 Mar 1863 in Carrollton, LA, from typhoid fever. 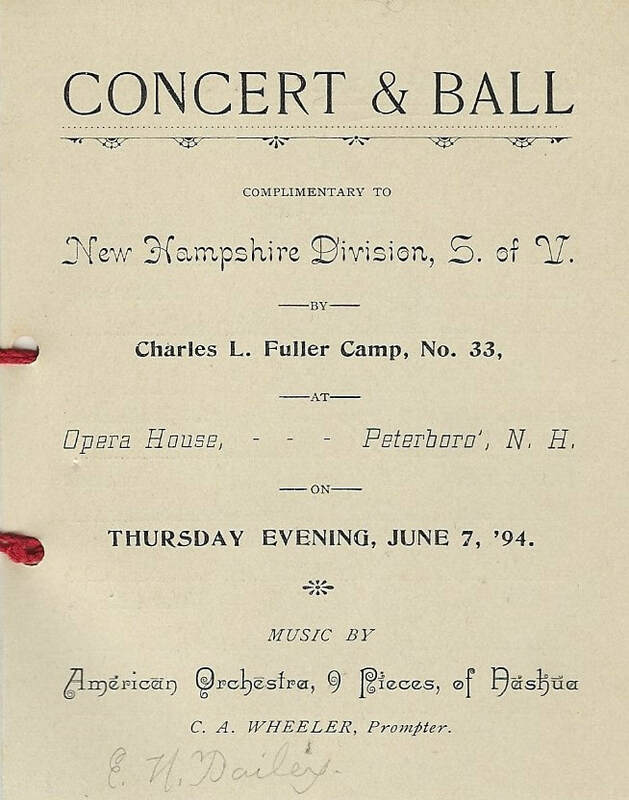 In Peterborough, NH, on Thursday, June 7th, 1894, the New Hampshire Division of the Sons of Veterans gathered for their 12th annual encampment. It opened at 1 p.m., followed by a banquet at 6 o'clock. That evening, a grand concert and ball was held. 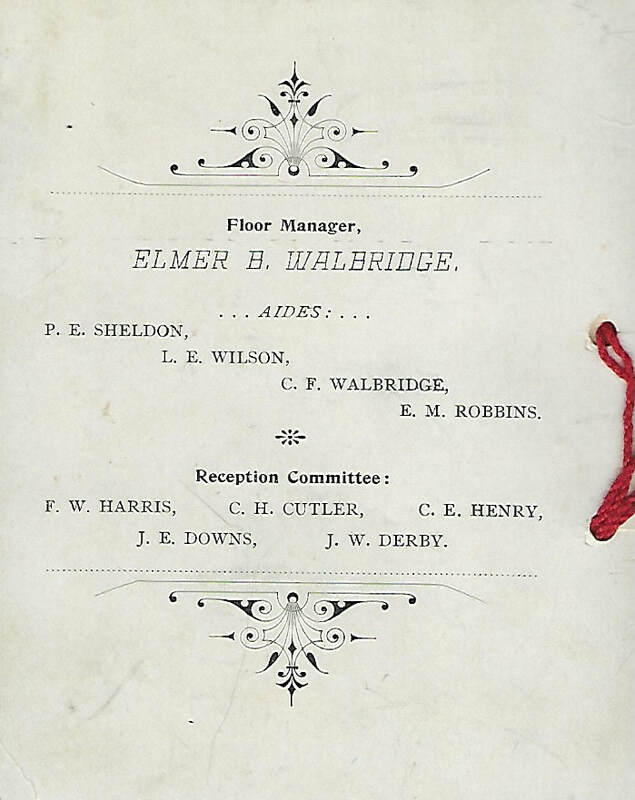 The above item is a "dance card", courtesy of the Charles L. Fuller Camp, No. 33. It belonged to Daisy Gray Caldwell, the daughter of the late Charles B. and Josephine (Gray) Caldwell. He had served in Co K, 60th Massachusetts Infantry. They were from Bennington, NH. "A.M.W" is probably Annie M. Woods of Bennington, who would marry the above Will Bellows in 1895. The encampment continued on the following morning, with a parade through the streets of Peterborough at 9 a.m. Members of the local GAR post also gathered for the event, and joined the Sons for their march through town. The business meeting began at 10:30.